Initially there’s the obvious choice of whether or not you event requires linings, many don’t. 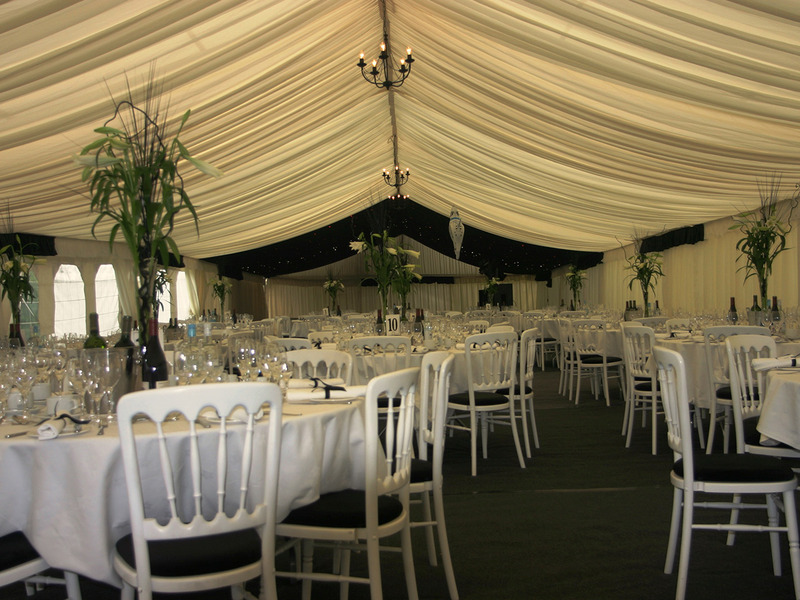 However for that special occasion and when it’s important to impress then we can offer a full Ivory pleated lining throughout the marquee, roof, walls, and window drapes. To complement these we offer a range of coloured ‘swags’ (a choice of 30 colours or more), whether to co-ordinate with your wedding scheme, or match your company or team colours. 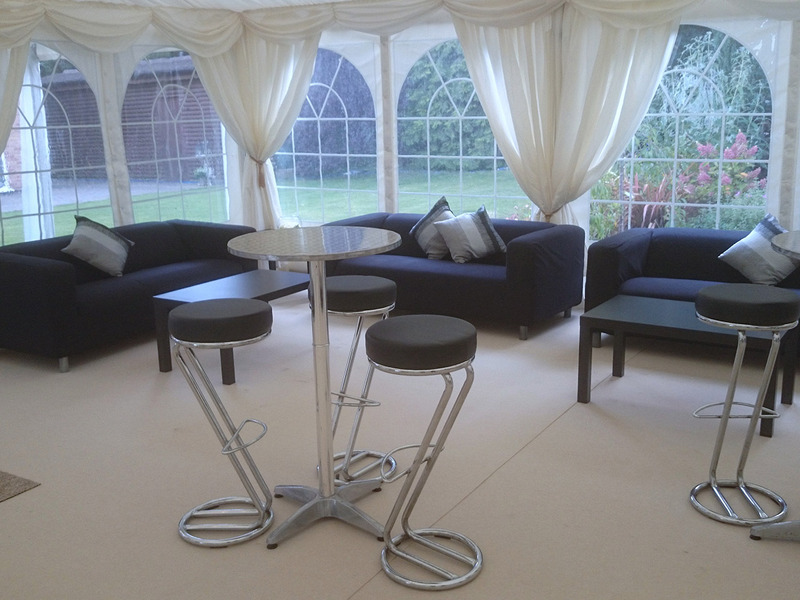 The swags can equally be co-ordinated with the carpet colours, the seat pads, and the ‘tie backs’ with chair covers. As an alternative to the Ivory pleated lining there is an option of Star- cloth / Black out linings, giving a number of effects. The first to give a more ‘night club’ effect in a dance floor area, our fibre optic roof lining can also be complemented with a simple lighting rig for a great disco. 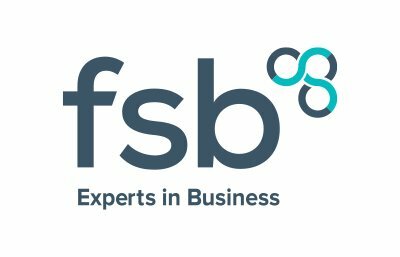 The second, if you’re holding a presentation within the marquee, most screens and projectors don’t give enough ‘lumens’ for people to see, therefore a blackout area will make screen presentations more visible. 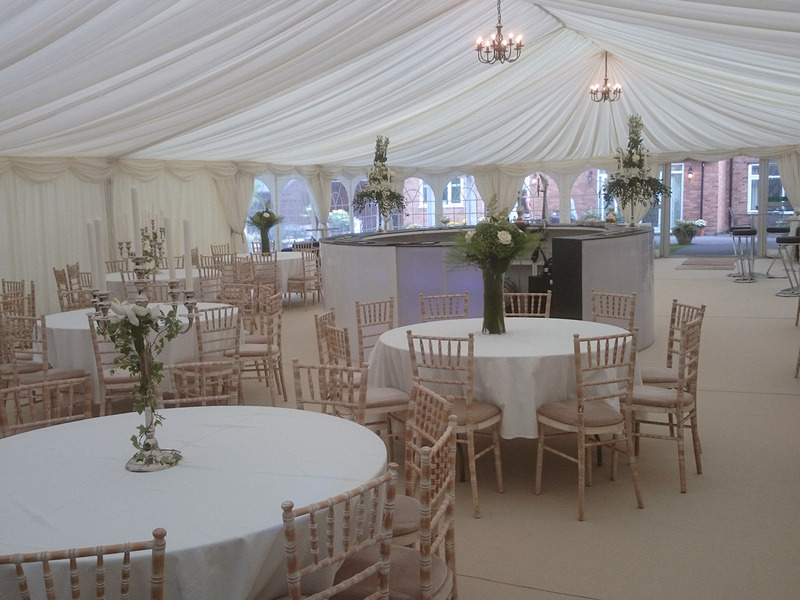 The optimum choice is a full interlocking boarded floor throughout the marquee, carpeted with new carpet from our full colour range. This will enhance any colour scheme to give impact to your event. For the more budget conscious then we can supply a cleaned used carpet in charcoal grey which will co-ordinate with any colour schemes and is more than adequate for many events. For hard standing applications we offer a ‘Rola Trac’ floor system, which can be carpeted. Our inventory boast over 1200sqft of Hardwood parquet Dance floor, which allows us to tailor make any size dance floor that you require. 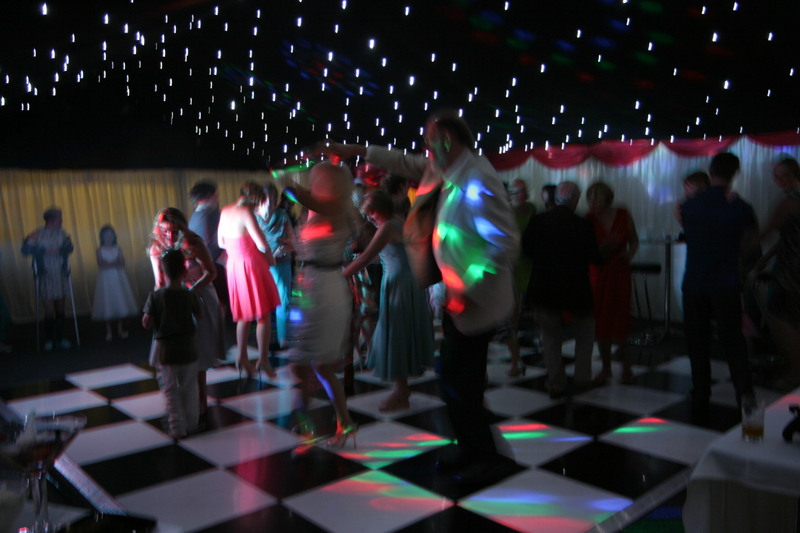 For that extra bit of style we can alternatively supply a lush white, or chequered black and white Dance floors. All of our marquees come with lighting included in the cost, as either chandelier lights, or florescent strip lights. When appropriate all the roof lighting comes complete with a dimming facility. The Chandeliers are of a ‘wrought-iron, style with candle bulbs, two sizes 5-arm, and 8-arm for large and small marquee spans. Up-lighting – for evening parties, mood lighting, and wall illumination. Spot-lighting – for lighting tables, stages, objects within the marquee. Mirror balls – for an evening / reception area lighting. Lighting rigs – for a spot-light disco effect over dance floors complete with light chaser Emergency Exit Lighting – often a requirement Flood Lighting – for entrances etc. Star cloths – Blackout roof linings with either l.e.d. or fibre-optic multi coloured star effect. Our standard stock has two chair styles, a premium white wood banquet chair with a choice of seat pad colours, and a budget white bistro chair also with a seat pad. In addition we can supply a full range of chairs from simple folding chairs through to a wide range of different colours and designs. For sophistication a chair cover with coloured tie back can be fitted to any of the banquet chair. 6ft to seat 10-12 guests. Banquet tables – a sectional table seating from 10 – 44 guests. 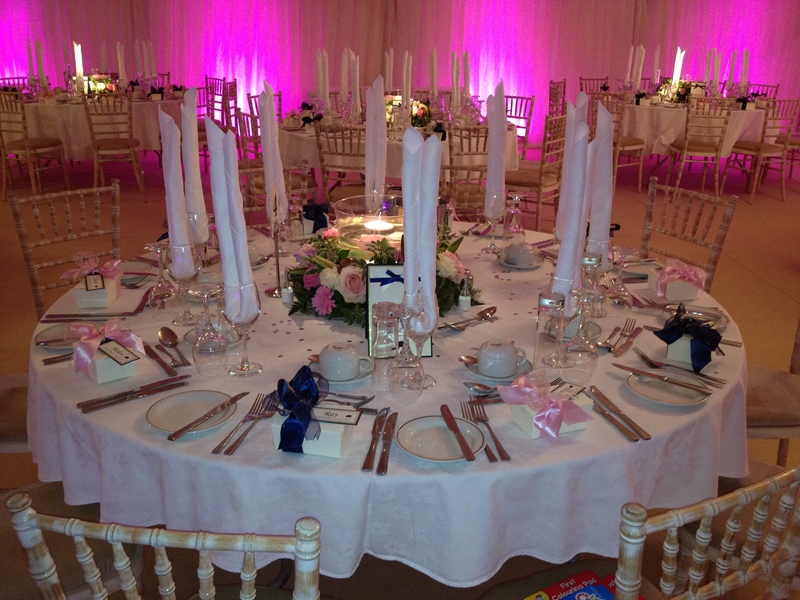 Top table straight – traditional table for a wedding party of 8-14 people (not trestle tables).